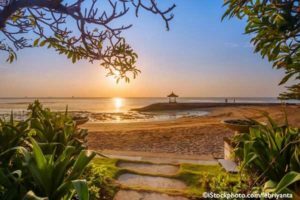 My adopted hometown of Sanur is the place to be for the best sunrise you’ll see in Bali. Depending on the time of the year, sunrise is usually around 6 a.m. Ride a bike or a take a leisurely walk to the beach, as the locals begin their day. The only sounds you’ll hear are the roosters calling, the scooters driving past and the occasional sweeping of a path. On the beach, watch as the sun makes its way up high. 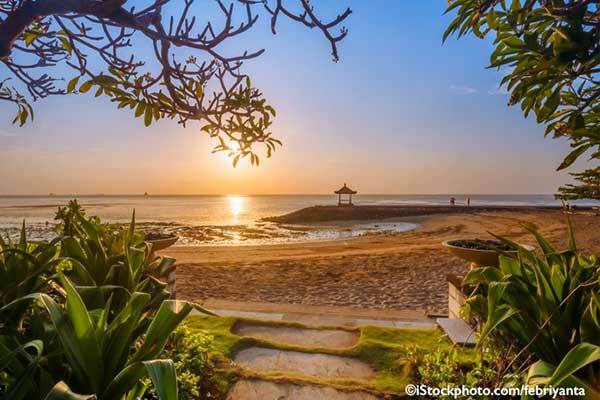 Golden skies reflect down to the lagoon-like waters of Sanur’s beaches. Fishermen make their way out for their daily catch and incense permeates the air as the local people make their morning offerings. It really is a special time of the day. Sunday’s are meant for feasting and you have quite a few options here in Bali. Many of the 5-star hotels offer different styles of buffet brunches and it’s a great way of viewing some of these places. Heaven knows, I’ll never get the chance to stay at one of these posh hotels! The best, in my view, is Soleil restaurant at the Mulia hotel located in Nusa Dua. For around $100 per person, you get free-flow wine, beer and a selection of cocktails, even bubbles are included. There’s a huge range on the buffet, including fresh seafood, a variety of salads, cold meats, Indonesian meals and prepared dishes. There’s a carvery of roast meats and a grill where they freshly prepare your choice. The dessert menu is amazing. On top of all that, select dishes are brought to the table as part of the chef’s selection. The great thing is you can graze over four hours, then afterwards roll onto a sunbed by the ocean. It’s best to book ahead to secure a table. 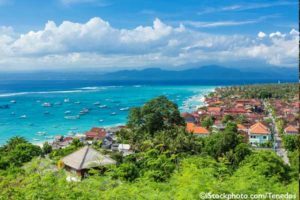 Just a 30-minute fast-boat ride away from Sanur is the island of Nusa Lembongan, filled with cosy beach hotels and dotted with luxury hilltop villas. Wake to views of the majestic Mount Agung towering over the turquoise waters… Hire a scooter for around $10 or a golf buggy for the day ($100) and explore… Head over the little yellow bridge to the neighbouring island of Ceningan and zip-fly across The Blue Lagoon. The waters are warm and clear, perfect for swimming or snorkelling. My favourite restaurant on Lembongan is The Deck. You’ll find it perched high on the hill at Batu Karang resort. It has the most perfect view. For a romantic getaway, the breathtaking Villa Aman is hard to beat. There are so many, I can’t choose, so I’ll list my favourites. Kuta beach for plastic chair beach bars and $2.50 beers. The Blue Lagoon near Candidasa for crystal clear waters and snorkelling. Nusa Dua beaches have the whitest and softest sand and the waves are manageable. For the adventurous, head to Amed for the black sandy beaches and home of one the best diving spots in Bali. The shipwreck of the U.S. Liberty lies close by at Tulamben and has become a reef brimming with marine life. After spending some time in Bali, the humidity, the water and the sun will play havoc with your hair. The perfect remedy is a hair creme bath available at most spas. First, they’ll cleanse your hair, then cover it in a hydrating conditioner. Once wrapped in a warm towel, your shoulders, arms and hands are massaged. You’ll be so relaxed you won’t be able to hide your smile. Your hair is then rinsed and dried leaving your locks shining and silky. I love this treatment, humidity is not my friend. The Nest spa in Sanur or Bodyworks in Seminyak are great options at reasonable prices. $19 and $21 respectively. 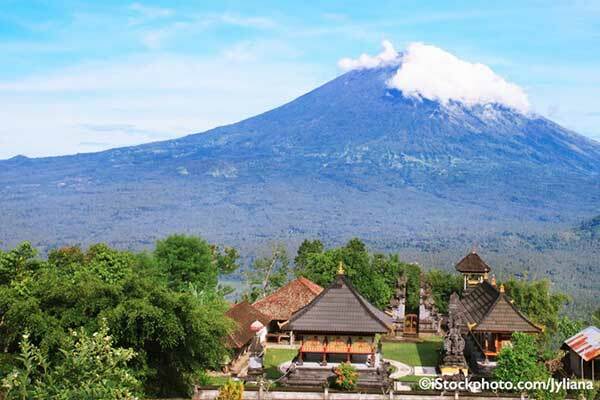 Lempuyang Temple is a two-hour drive along the coast line of East Bali from the capital, Denpasar. The main temple is 1,175 metres above sea level and is one of the island’s most highly-regarded temples. There are actually seven temples in the complex and around 1,700 steps to reach the very top, but you don’t have to go that far. 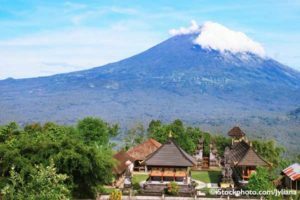 The most famous spot is on the first level, where a traditional gateway opens to spectacular views over Mount Agung. 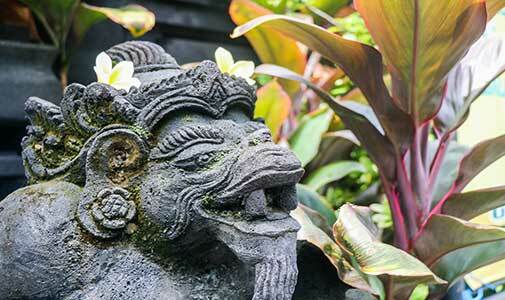 This is also where you’ll find the towering dragon staircases of Pura Penataran Agung temple. It’s the perfect spot for photos. You do need to have your shoulders covered and wear a sarong to cover your thighs. These can be rented for $5 if needed. Personally, I don’t think you can go past sitting on the beach at Legian, with your feet in the sand and a cocktail in hand. The months of March through November are the best times to head over to the west of the island, before wet season hits. There are many beach bars with coloured beanbags and umbrellas to sit under. Grab a cocktail and a bite to eat and watch while the sky turns to hues of orange and red as the sun sinks into the ocean. Our favourite place is a restaurant called K-Resto on Double-Six beach.